A recent blog post got wildly out of control, resulting in this eBook. 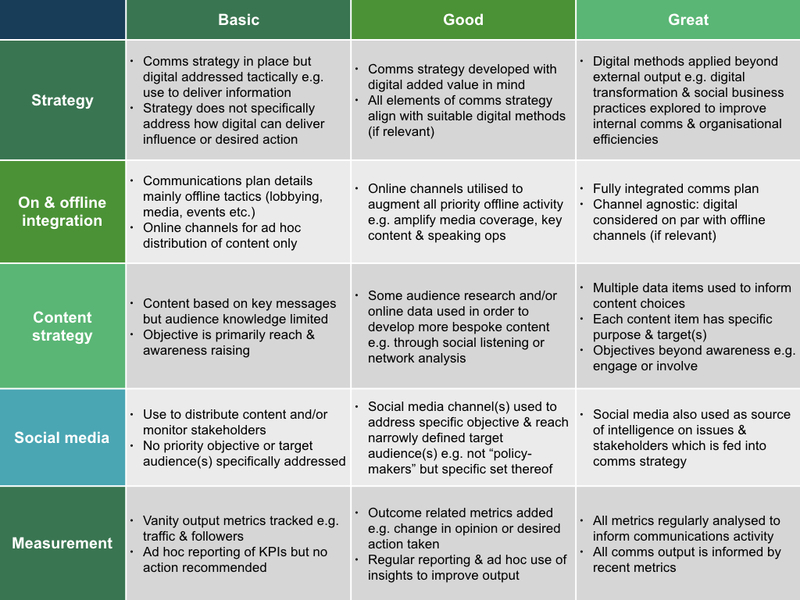 In it, I provide ten short reflections (commandments) that I believe are essential to the successful practice of digital public affairs in Brussels (and beyond). While there are practical tips in it, it is not intended as a practical guide on channels and best practice. Plenty of practical guides exist already. 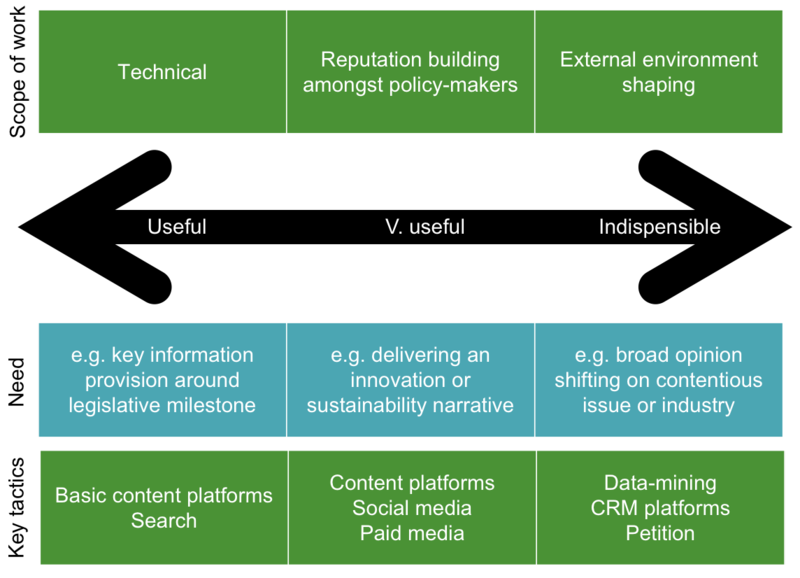 Somewhat ambitiously, it is more an attempt at further professionalising the practice of digital public affairs in Brussels, by seeking to outline its impact and applications beyond the realm of just channels and tactics, which has sadly been the norm. I had originally wanted to make this a collaborative effort but ended up writing it myself. In other words, there is plenty of room for improvement, and I would like to publish an update early next year in which I build on a few of the main concepts. So, if you spot anything you disagree with or you believe could be enhanced, please do let me know. It’d be much appreciated. 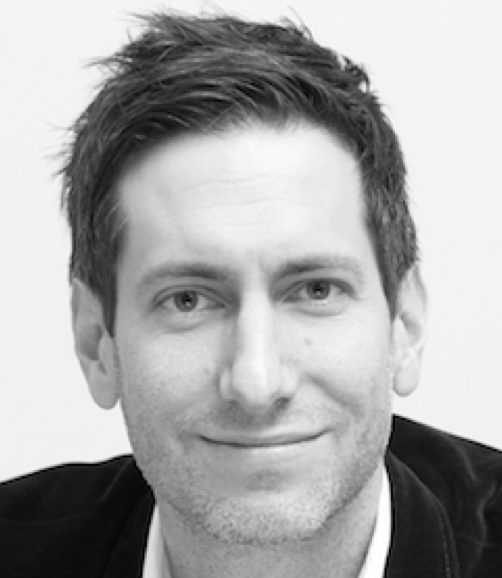 I’ve recently written about different communications requirements (digital and other) on technical vs. politicised public affairs dossiers here and here. 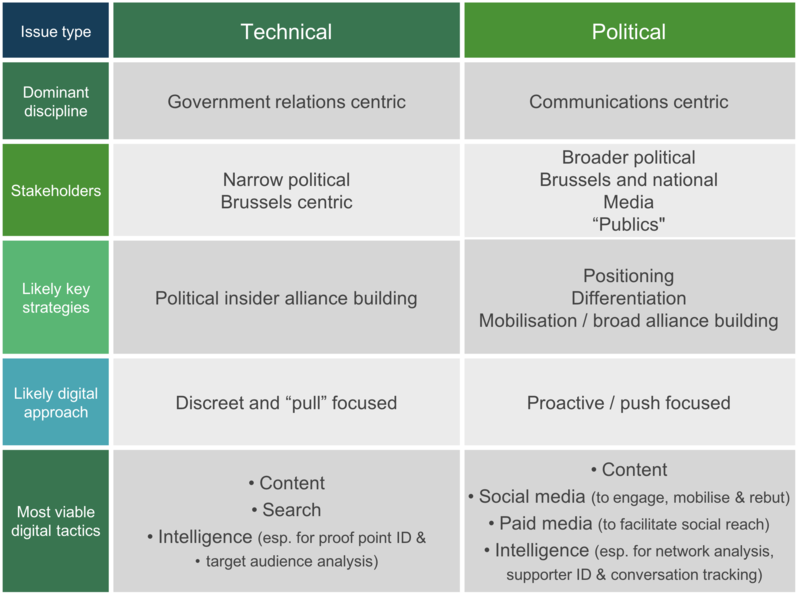 On the same subject, here is a table that outlines, in basic terms, different viable strategies and digital methods that are most likely to be utilised on technical vs. political issues in EU public affairs. In summary: digital remains relevant on technical dossiers, but on a more discreet level and with fewer tactical options. NB: clearly, items in either column could quite easily also fit in the other, depending on issue, stakeholders and environment. Food for thought, I hope.